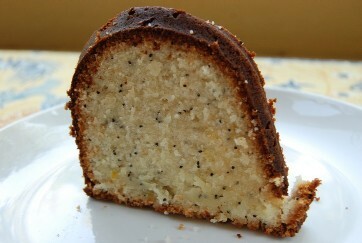 A twist on pound cake that’s most definitely not to be taken for health food – low sodium or not. I developed this recipe especially for my sister, a BIG lover of lemon cakes. This one’s for you, Sue! Preheat oven to 350 degrees. Grease and flour a 10-inch tube or bundt pan; set aside. In a large bowl, cream together the butter, shortening and sugar. Add the eggs, one at a time, beating well after each. Add the lemon juice, lemon zest, extracts, and poppyseeds and stir. Add the baking powder and stir again. Gradually add in the flour, alternating with the milk. Pour batter into the prepared pan and gently smooth top. Place pan on middle rack in oven and bake 1 hour and 15 minutes, until tester inserted in the center comes clean. Remove from oven and hang the pan over the neck of a wine or champagne bottle to cool. Cool fully before removing from pan.